I am back! I can't believe how long it has been since I have blogged. Boy, does life get busy sometimes. So I will start by bringing you up to date on my life. As you may recall, we had a rental house burn down in 2012. Well, we finished rebuilding and sold the house in August which has led to a new construction project. We are remodeling our place over at the coast. In November, we spent two weeks at the coast, catching and eating a ton of crab. We had crab cocktails, crab cakes, crab salads, crab enchiladas, crab mac 'n cheese, crab omelets and crab sandwiches. Needless to say, we got our fill of crab! As soon as we returned home, I had a class and a workshop and then our daughter came home for the Thanksgiving holiday. Boy, was it good to have her home. The best part is that she returned to Montana for two weeks and then was back for Christmas break for over a month! She headed back to Montana the second week of January and I have been playing catch up ever since. So today I decided I really needed to catch up with all of you! As I am sure you can guess, a lot of the projects that I will be showing you over the next few weeks are from last fall. Yes, that means Halloween and Christmas cards! I hear ya, "what am I going to do with ideas for holiday cards?" Well, just file them away until this fall - which will be here before either you or I know it. Or, even better, get started on your cards now! Here is a Box Fold Card that we did last year - I don't know how I missed posting it earlier! 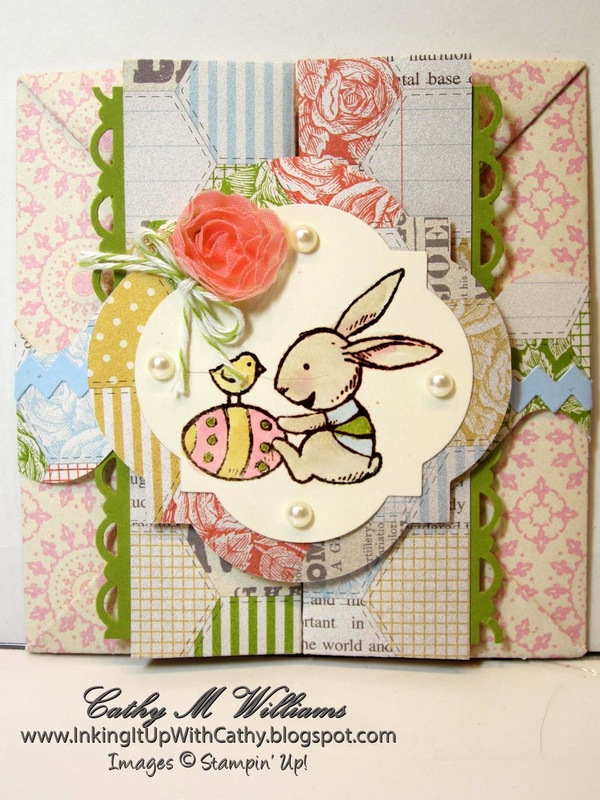 I loved this little bunny from the Everybunny stamp set which has retired but you can definitely use the cute animals from the Life in the Forest set from the Occasions Catalog.